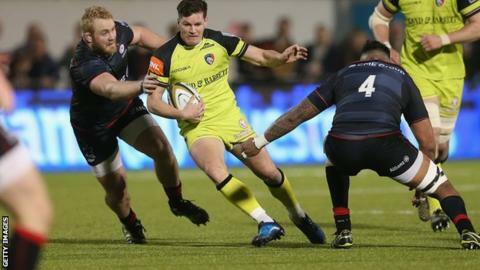 Freddie Burns scored 17 points as Leicester ended Saracens' Anglo-Welsh Cup title defence to reach the final. Burns kicked a penalty and converted George Worth and Luke Hamilton tries to put Tigers 17-5 up at the break, with Henry Taylor going over for Saracens. Ellis Genge crossed and Burns kicked a penalty and converted his own try to seal victory, with Matt Gallagher grabbing Sarries' only other points. Leicester face either Exeter or Harlequins in the final on 19 March. Quins travel to Chiefs' Sandy Park on Sunday for the second semi-final looking to reach the decider at their Twickenham Stoop home seven days later. Leicester's victory, their first in four meetings against Saracens in all competitions this season, ends the London club's cup defence, with Sarries holding the trophy for 720 days after the competition did not take place in 2015-16 because of the delayed start to the domestic campaign brought about by the World Cup. Sarries' 16-12 win over Leicester at Welford Road on 1 January was a result which promoted Tigers to sack director of rugby Richard Cockerill the next day. The East Midland club's first final appearance in any competition since winning the 2012-13 Premiership title comes just three months after head coach Aaron Mauger took charge on an interim basis. Both sides made a number of changes, with Saracens fielding an entirely different starting line-up to the team which beat Newcastle in their previous game. South Africa winger JP Pietersen and try-scorer Hamilton were two of just three to retain their spots following Tigers' defeat by Exeter a week earlier, while first-choice fly-half Burns marked his return to the starting XV with a 67th-minute try. Saracens academy coach Ian Vass: "It's our first loss at Allianz Park in over a year but it wasn't all about winning or losing. "It was important for this group to have the experience of playing in a semi-final as they are a whole new group from the one that won this competition two years ago. "We are frustrated as we never really got into the match for the breakdown area was a mess and it didn't help the flow of the game." Leicester assistant coach Geordan Murphy: "We had a lot of experience out there and the boys got stuck in and played for each other. "It was important that we got the first score as Saracens can put you under a lot of pressure if they go ahead as it proved in the league fixture here. "So we focused on that and our forwards deserve a lot of credit by controlling things as some of them have been out for a considerable period and badly needed game time." Saracens: Gallagher; Ellery, Streather (capt. ), Tompkins, Earle; Whiteley, Taylor; Barrington, Saunders, Koch, Lemalu, Flanagan, Brown, Conlon, Vunisa. Replacements: Lindsay, Stringer, Lamositele, Isiekwe, Burger, De Kock, Lozowski, Perkins. Leicester: Worth; Brady, Tait (capt. ), Roberts, Pietersen; Burns, Kitto; Genge, McGuigan, Balmain, Wells, Kitchener, Hamilton, Thacker, McCaffrey. Replacements: Croft, Rizzo, Bateman, Maksymiw, Owen, White, Williams, Thacker.